So Dave won tickets to the Bee's game on Tuesday night so we went with Heath and Crew. Andrew was so excited that when we were waiting outside for Heath he kept running at the stadium yelling "ball", thinking we were just going to let him go in by himself. 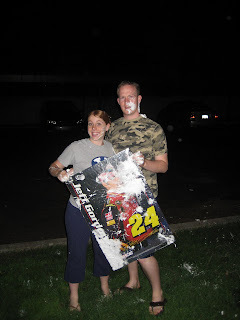 We only stayed until the 5th innning but we still had a blast! This is Andrew intently watching the game. He was pretty fascinated. Here is Crew. Isn't he just the most adorable little guy you have ever seen! He was so good at the game, even though he was a bit squirmy. It is so hard when they are crawling cause they want to get down and go but you can't let them. Here is a picture of the boys together. This was taken right as we were leaving so they were both pretty tired. We had to get a picture of them together though Dave said, I guess to prove that they were both there! This last picture is of Andrew with the Bee mascot. The whole game he would find him out in the stands and wave to him, but when we got close he was petrified. All I can say is that if he is afraid of the Bee he will really be scared of Cosmo. I guess we will have to see what happens then! So Clawson grandchild number 25 was born yesterday. 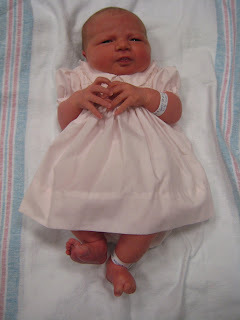 Congratulations Tim and Rachel, she is beautiful! So Andrew loves the camera but we don't usually let him play with it. Today he found the camera and I decided to teach him how it works. He usually just wants to look at the pictures that have already been taken. He loved watching me make funny faces through the window so I convinced him to make a few so I could take some pictures. Here is what we came up with. Also, Andrew has gone down to one nap but I wanted to share with everyone what I have been doing so it feels like I get two naps from him. I still put him down at the same time as he did before for 1 nap, which is about 10am. He sleeps for about 1 1/2 to 2 hours. Then when 3pm rolls around, the old time for his second nap I put him down again but I put all his board books in his crib with him. He sits and reads for about 30 to 40 minutes and then when he is bored he calls me and then I lay him on my bed an turn on Curious George. He is a huge fan and he will sit there for the whole half hour and watch the show while I do other things around the house. It is a great system because I still can get things done both morning and afternoon and Andrew doesn't get cranky because he has geniune time to rest. Just a thought if anyone is a sad as I was about going to one nap! One of the best things in the world is walking into a room full of small children and 3 adults and have every single one of them tell you what a wonderful, good son you have. I love nursery!!!! I thought it was very simple and the green in the trees would go perfectly with our broccoli couches. Then I looked at the price...75% off. I couldn't resist getting a perfectly framed piece of art for $18 when it was originally $71. Here is how it looks over the loveseat. I love when I find a deal and when I fall in love with it! Unfortunatly that means I am off to Hobby Lobby in search of a pillow form! I really need to work on remembering my camera. I have decided that the next time I update my cell phone I need a camera phone so that I will always have a camera with me. Friday night we went up to West Jordan for the night. No plans really but we were able to give Cindy her graduation present. I found the cutest bedding set at Ross for $25. I will have to get pictures once it is all set up in her dorm room for you to see. We then went to Children's Place to hit the sale and then to Jamba Juice. Dave has been living off of Jamba Juices because he had a tooth pulled on Tuesday and it is the most comfortable thing for him to eat. Saturday morning I got up and left the house at 8:15 before Dave or Andrew made any signs of waking up to go to breakfast with some friends from the ward. First, if you live near Provo or are visiting soon you must eat at Magleby's Fresh for breakfast, it is to die for. Second, I am going to miss you Christina! You will have to become an avid blogger so we can all stay on top of your adventures in Philly. When I got home Andrew was down for his first nap so Dave and I cleaned and then we headed off to do more shopping. Dave desperatly needed new shorts. After shopping, Andrew went down for a second nap and I being the wonderful wife I am took the car in to get the oil changed so Dave could take some pain medication and go to sleep. Then Saturday night we went to the carnival in American Fork. 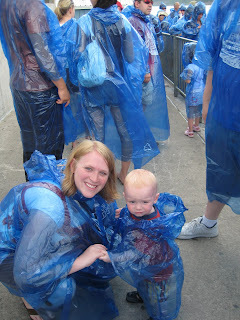 Andrew loved all the rides. We took him on the carousel and the ferris wheel. Sunday was normal. The greatest thing was that Andrew went to nursery and wasn't even phased. He stayed the whole time and every time we checked on him was participating and playing. We have only attempted to take him once before and he came out crying within 5 minutes. Hopefully it is a good sign that the transition is not going to be as hard as I thought. I am keeping my fingers crossed! I know that it is a week delayed but I was deteremined to post in order. It was nice to be back in Utah for the 4th. We went to a movie in the morning, Mandy and I and the kids watched Kit Kittredge and Dave went to Get Smart. 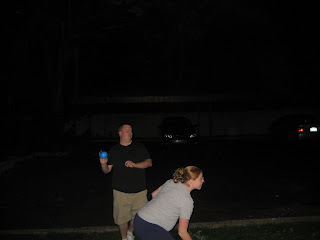 Then we went to my sister Mandy's house for a barbeque, which was delicious. Then we headed to Thanksgiving Point to watch the fireworks. Here are some pics of the day. This is Andrew with a sparkler. I know, super dangerous but he was feeling really left out. 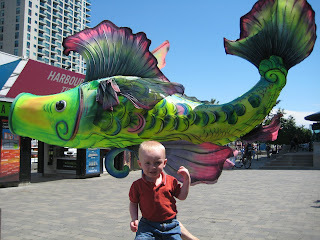 After he held one, he was done and ran off to play on the big wheel. This is Andrew all in his PJs ready to watch the fireworks. This is Andrew and I watching the fireworks. He was so in awe. I think it was one of the best fireworks shows I have been to just because of Andrews excitement. Here are Dave and Andrew watching the fireworks. Even though the fireworks show was pretty long after about 5 minutes Andrew lost interest and just ran around our blanket over and over again. I guess he needed to wear himself out because as soon as we got into the car he was asleep. So after we came back to Detroit we really just relaxed and hung out. We went to see Kung-fu Panda, made lots of smoothies and played games at home. It was nice to relax. Tim had this great idea that we all go to the dollar store and we each had $4 dollars to spend towards a game. Of course, his game was the most original so it was the only one that deserved picture documentation. I think the pictures speak for themselves, check them out. 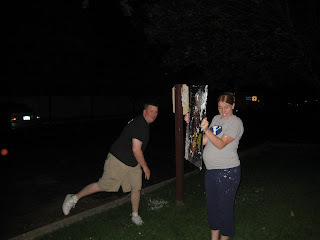 Yes those are balloons filled with shaving cream being thrown at a poster covered with tacks! Thanks again for a great vacation Tim and Rachel!!! On Monday we drove and saw Niagra Falls. They were amazing! We decided to stay in Canada and view them from that side and it was so worth it. 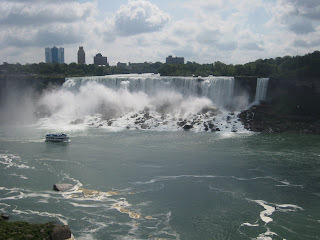 If you ever go you need to see them from the Canadian side, it is a much better view. 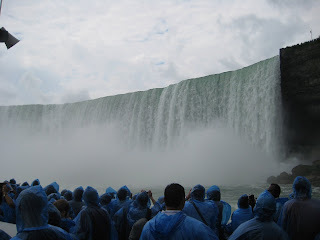 We had heard from Rachel's dad that the best way to see the falls was from the Maid of the Mist, a boat that takes you right up to the falls. 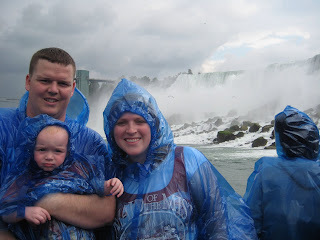 He was right, you get soaked, despite the ponchos provided, but it was an awesome way to see the falls. 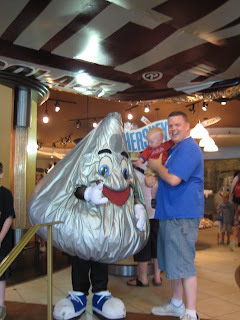 After viewing the falls we walked over to Planet Hollywood and ate lunch and then got a milk shake at the Hersheys store. 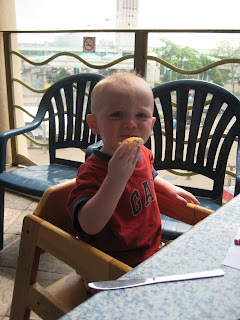 Whenever we went to dinner Tim could not resist giving Andrew the lemon from his water because even though Andrew hated it he would keep eating it. After one more look at the falls we headed back to Detroit. On Sunday we had a pretty relaxed day planned. We got up and made it to Sacrament meeting in a local ward. 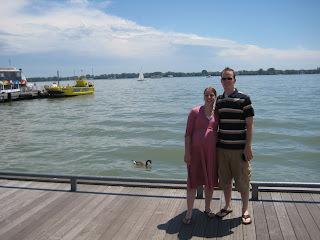 Then we ran back to the hotel, packed up and went to downtown Toronto one more time. We walked along the waterfront. It was beautiful but really hot. 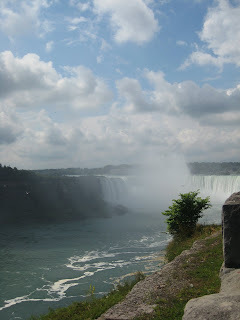 After taking some picture was loaded into the car and headed to Niagra Falls. It is just a short drive, about 1 1/2 away so we just went and found a hotel just outside the city and settled down for the night. 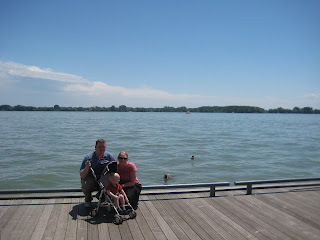 On Saturday, after a wonderful breakfast at our hotel we headed back to downtown Toronto. This is where we split up. 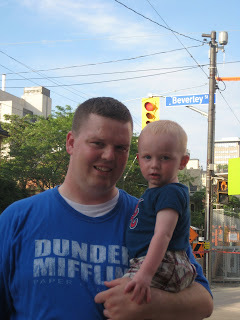 The boys, Dave, Tim and Andrew went to the Braves vs. Toronto day game and Rachel and I visited Casa Loma. 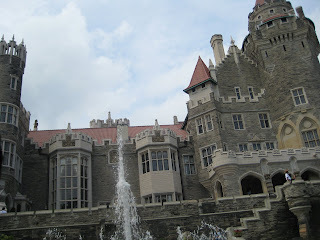 Let me start with Casa Loma, which means house on the hill in Spanish. 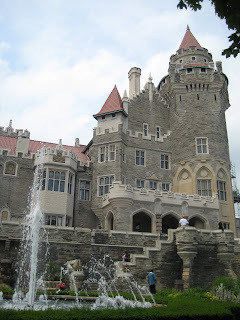 It was a house in the middle of Toronto that looked like a castle. 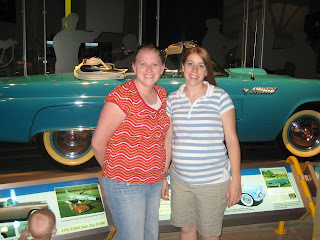 It was really interesting and a fun place to visit, without children and men and with another history lover. It was built by the guy who was the first man to harness the energy of Niagra Falls but then the Canadian government took his power plant away after about a year and didn't pay him for it so he lost his house and it pretty much became a tourist attraction. These are some outside pictures. The house has over 100 rooms in it with a underground passage way leading to stables. The house was also surround by some beautiful gardens. 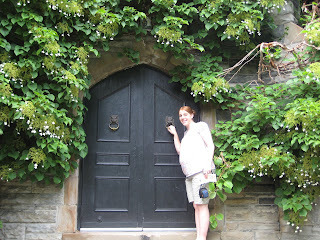 This door just looked secret garden to me so I had to take a picture. 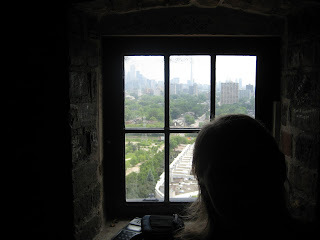 We got to go up to the highest tower to look over the city of Toronto. It was a great view but a difficult climb up there. I was so proud of Rachel climbing up, I think 4 flights of stairs, three being small, metal circle staircases. The boys had a blast at the baseball game even though the Braves lost. Dave had found some good tickets on e-bay so they were only about 20 rows up, directly behind the Braves dugout. Here is a view from their seats. This is a picture of Chipper Jones swinging the bat on the on deck circle. Chipper was hurt during this series so he didn't play but he did come up before the last out. Unfortunatly, the guy got out so Chipper didn't play. This is a picture of the catcher, Brain McCann. After one of the innings, (Dave would tell this story so much better because he was there) Dave took Andrew down to the top of the dug out as the Braves players were heading back down. Brian McCann had the ball in his hand and as he approached the dug out he point directly at Andrew and rolled him the ball on the top of the dug out. As Dave told me the story all I could think was, I guess it was worth it to dress Andrew in his only Brave's gear which happens to be a 6-9 month onsie. Good thing Andrew is still little! Andrew loves his souvenier and wanted to carry it around/throw it the rest of the trip. 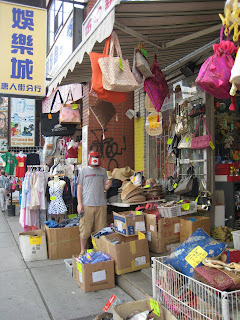 After our separate adventures we met back up in Chinatown. With Tim serving his mission in Taiwan, we had someone who could really find us the best Chinese food. The restaurant was great and then we had to poke around the little cheap shops. Tim wanted to buy this hidious Canada visor but Rachel would not let him. Thank goodness. This is a street in Chinatown named Beverly. We had to get a picture for Dave's mom. We had a full day planned on Friday. 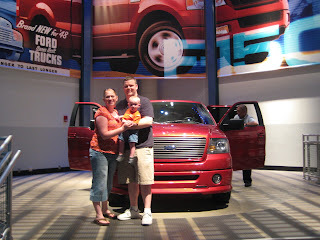 We started out at the Rouge Factory Tour where we were able to see the Ford F-150s being built on the assembly line. It was really interesting to watch the people put together a car, start to finish while it was moving. You get to walk around on an elevated walk way and watch as the assembly people go about their normal work day. Then in the lobby you can watch two movies, one about the history of Ford (the company and the man) and the other about the building of the F-150 with cool interactive seats. It was like you were on a ride at Disney. 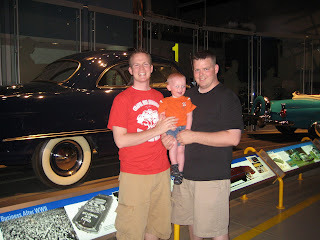 Here are some pictures of us taken with some Ford classics. 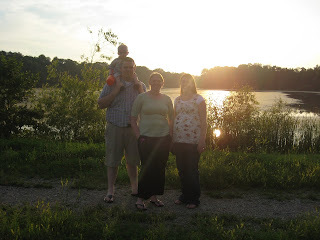 Then we ran home, loaded up the car and were off across the border to Canada. After an hour of driving around downtown Detroit, with directions, we finally crossed the border and were on our way to Toronto. 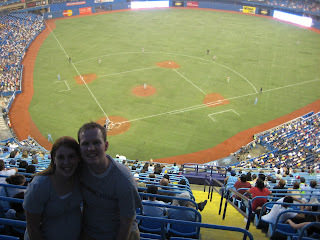 With all the delays we ran to our hotel rooms to quickly check in and then we went to the Braves vs. Toronto game at the Skydome. It was so much fun. The Braves won and Jurrgens pitched an amazing game. Plus, Andrew finally figured out it is Ball not Mall! Hooray! So this is actually day two because we left on Wednesday but our flight was delayed two hours and with the time difference (Detroit is on Eastern time) we did not arrive until 2 a.m.! Andrew was an angel throughout the whole flight and everyone on the plane fell in love with him. Our first day we slept in until 10! 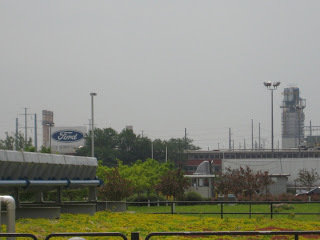 But after we got up, we went to pick up a rental car and got a little tour of Livonia, the actual city where Tim and Rachel live. 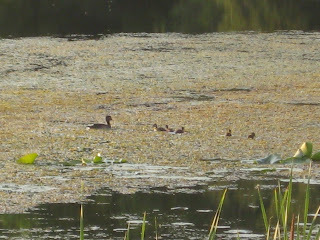 Then when Tim got off of work we went for a walk in the park behind their apartment. It was beautiful, but very humid!